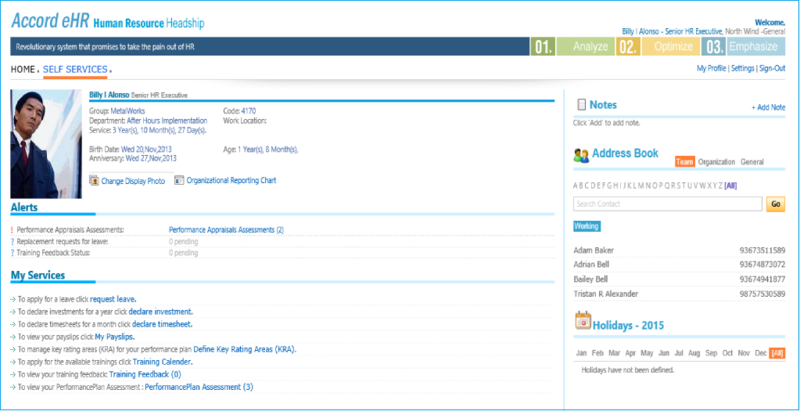 ﻿ Accord HR Application | One of the Best Cloud HR Solution. Manage HR Policies & Procedures, Benefits Administration, Industrial Relations Advisory and Occupational Health & Safety. Manage HR Application Processing with workflow based Appointments & Engagements for comprehensive Manpower Planning & Organizational Design. Manage employee Training and Development needs that are identified durring the performance evaluation process. The Performance Management & Appraisals function handles the individual performance management details, which is centered on the staff appraisal process and the development of staff through training interventions. Cloud Technology today provides the competetive edge that's the need of todays growing business. Intelliob offered HR cloud and Online Cloud Payroll solutions are designed to centralize data management for easy access to business decission makers and Human Resource administrators. Exploit Technology as driver to Optimize HR practices. Comprehensive workflow bsed online recruitment management process with automated alerts and approvals intimation to all involved in the recruitment and selection process.